How do you add warmth, texture and balance to a modern home rife with architectural angles and contemporary metal and concrete work? You set it all against a backdrop of rich Walnut flooring. 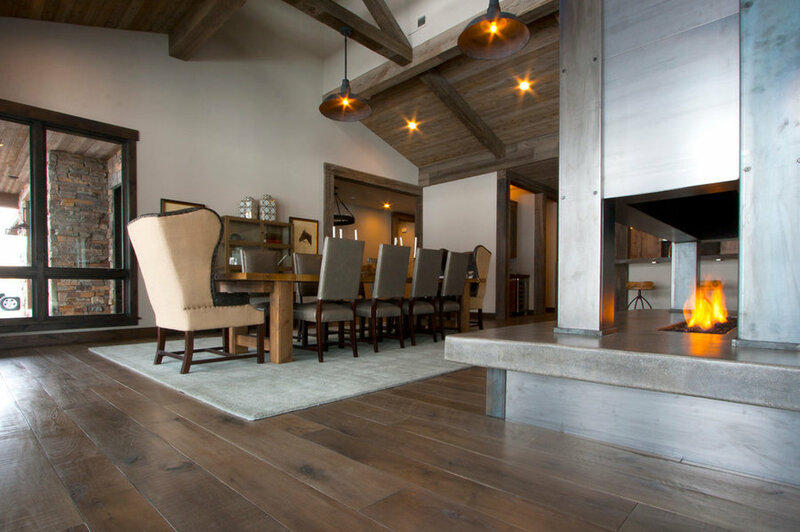 PC Development, working with Gary Barrus of Signature Floors, chose this 6”, 7”, 8” and 9” plank Walnut floor to bring all the elements of the Great Room and Dining Room together. Barrus thinks they made a canny flooring choice. 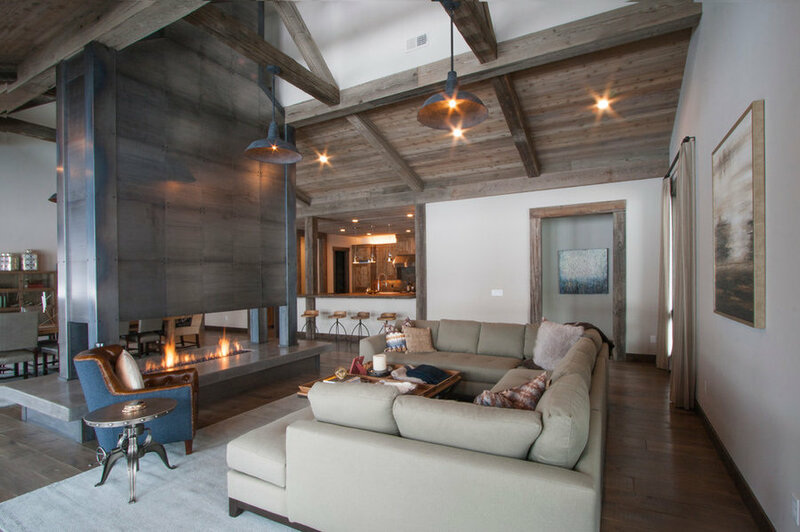 “This floor provides a base from which the concrete and iron fireplace emerges naturally. It’s got a great organic feel.” Opting for an oil finish over polyurethane means greater depth to the hardwood and provides a look of instant age. As more oil is periodically buffed into the surface of the floors (standard maintenance for oil finishes) the floor develops a beautiful patina that becomes richer over the years. “Oil finishes,” Gary observes “when maintained properly, don’t wear out; they wear in and become better and better with time.” The home is located on Old Ranch Road just off the main highway leading into Park City proper. The metal, glass, stone and wood elements blend seamlessly with the arcadian setting. 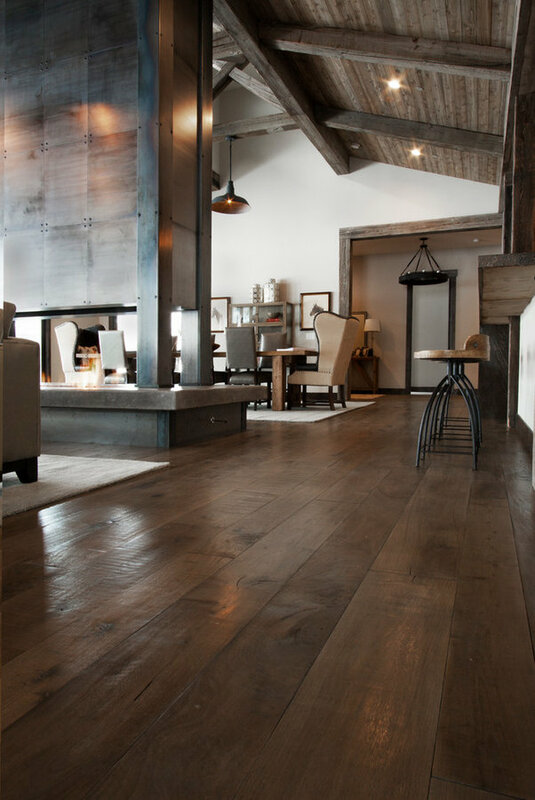 Custom-colored Richard Marshall walnut hardwood flooring reflects the aged beauty of the reclaimed ceiling material. Image by Colette Duran. 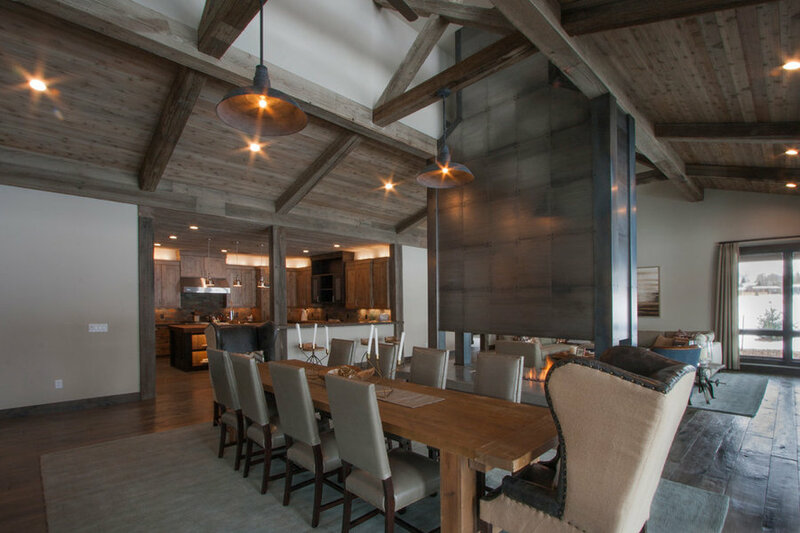 Subtle texture and multi-step stain process results in a rich mink tone, perfectly complimenting the contemporary take on rustic design. Image by Colette Duran. 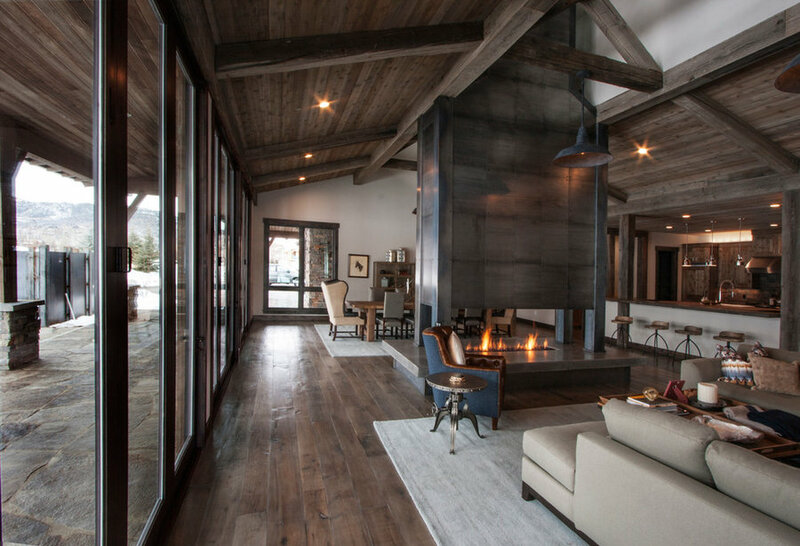 Concrete and hardwood have a lively conversation in this mountain modern setting. Image by Colette Duran. Elemental color of the hardwood flooring is a jumping-off point for the eye to explore the exchange of old and new ideas in this great room. Image by Colette Duran. Grey and neutral tones can provide warmth and a cozy feel when combined with soft and rich textures. Image by Colette Duran.